Mizuno Wave Paradox 4 are stability cushioned running shoes. 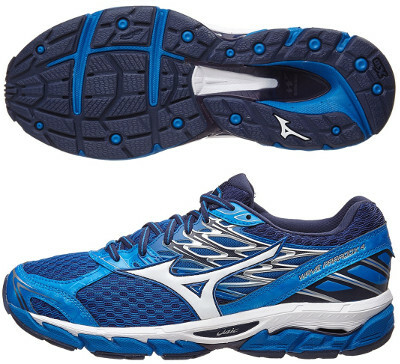 The Mizuno Wave Paradox 4 is the premium running shoe from japanese brand within pronation control listing. Current iteration from Mizuno to gain some market share from current top seller Asics Gel Kayano 24 is based on abundant cushioning, superb stability and latest technology but high price tag so it is mandatory to keep an eye on price drops. As expected, upper gets a cosmetical update from its predecessor Wave Paradox 3. Several sewed overlays produce a consistent structure over breathable and open mesh (AirMesh) for heavy users while specific unit with multiple holes embrace midfoot for snug and secure fit. As well as other Mizuno models (like its smaller sibling Wave Inspire 13), it keeps internal stripes (Dynamotion Fit) for more supportive fit. There is no change compared to last edition regarding the impressive midsole which not only features huge cushioning but also great stability and rigidity beyond the usual standard. It keeps the same configuration than its counterpart for neutral runners Wave Sky featuring U-shaped Fan Wave (instead of CloudWave™) between full length U4ic™ layer for more responsive ride above and decoupled U4icX™ for enhanced comfort below. Outsole remains unchanged with deep flex grooves in the forefoot for smooth ride and reliable X10 rubber in more exposed areas to increase durability.